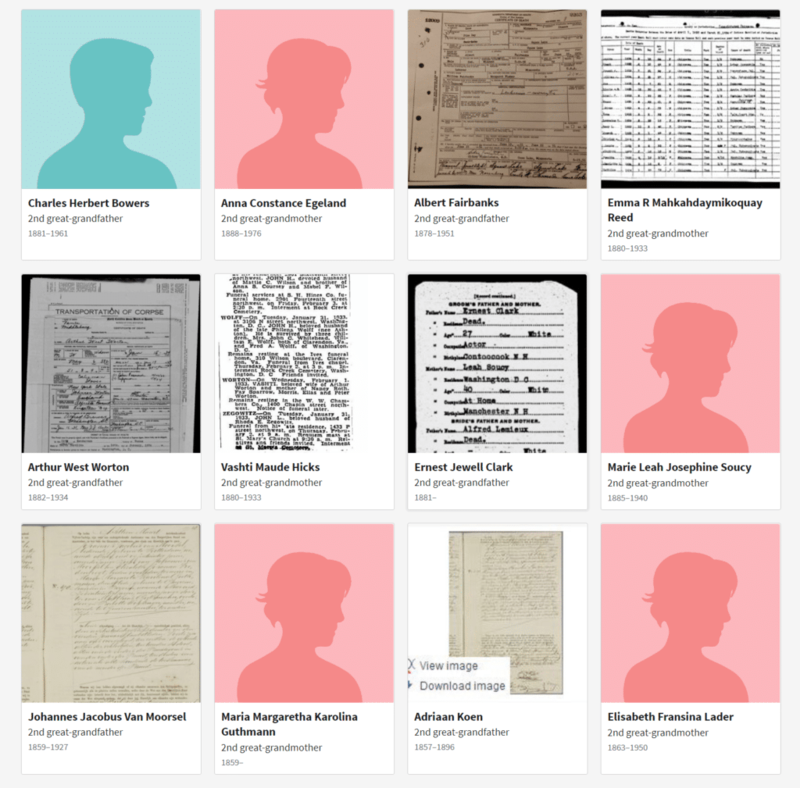 In February, Ancestry CEO Margo Georgiadis announced three new features at RootsTech 2019, an annual conference that has become a highly anticipated annual event for genealogical tech enthusiasts (and isn’t that all of us these days?). 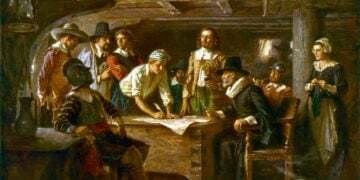 Not surprisingly, two of those additions were related to AncestryDNA, the largest repository for genealogical DNA with more than 10 million participants. 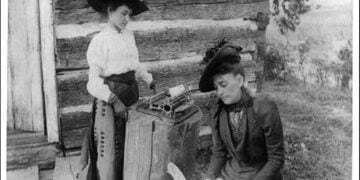 Please know that Family History Daily partners with many genealogy companies, including Ancestry, and may earn a fee to support our work if you take advantage of their services after following a link on our pages. The first AncestryDNA enhancement — called “New & Improved DNA Matches” — is just that: a new layout for reviewing your AncestryDNA matches that offers color coding, labels, and other tools to help you review, organize, and customize your matches listing. ThruLines™, the other new AncestryDNA feature, is yet another advancement in Ancestry’s quest to help you make sense of your DNA results by illustrating how you might be connected to a particular match. 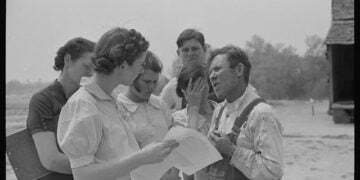 It’s also another big step forward in their efforts to connect DNA testing and traditional genealogy research more seamlessly. 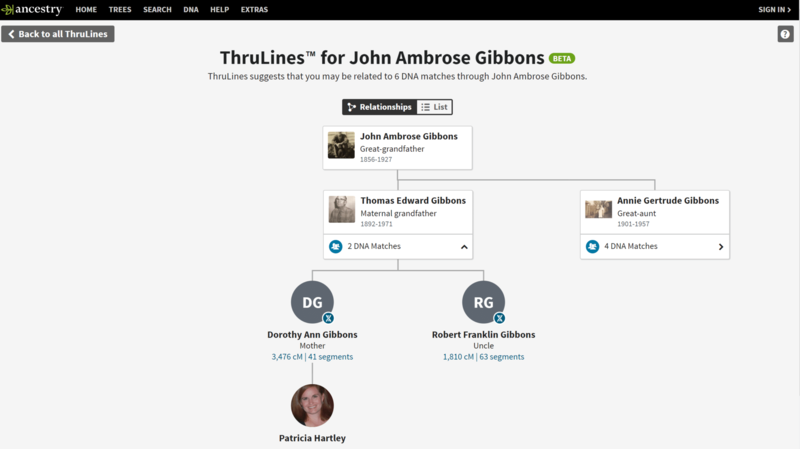 ThruLines is currently in “Beta” mode, which means that Ancestry has made the feature available for a limited time so that members can play around and provide feedback, while in the background Ancestry continues to refine the tool and make improvements. During Beta testing, the feature is available to all Ancestry members who have tested their DNA, but whether it will eventually require an additional paid subscription has not yet been determined. In Beta mode, only members with subscriptions will see the records and trees associated with ThruLines, but all members will see the matches. 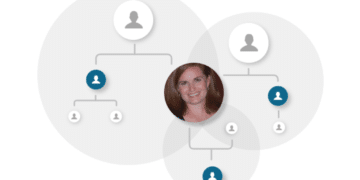 Because this new feature works by connecting together family trees (sometimes from many people), DNA results must be linked to a tree that is in “public” or “private searchable” setting. If one of your DNA matches has a private tree, you’ll see that you have potential ThruLines suggestions for that match, but will have to reach out to the owner of the tree to learn more. In other words, use ThruLines as a tool to help you evaluate and further validate your potential shared ancestors, rather than blindly accepting ThruLines recommendations as facts. With all of that out of the way, let’s see what we can do with ThruLines! 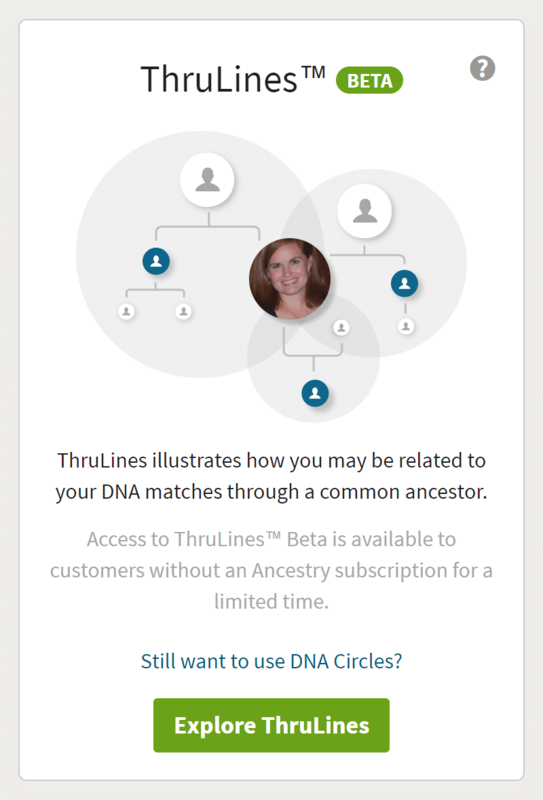 If you’ve met the criteria above, you can simply click on “Explore ThruLines” in the new ThruLines Beta box on your AncestryDNA home page (find this by visiting Ancestry and choosing DNA from the top menu and then Your DNA Results Summary from the dropdown.) You can also access ThruLines directly here. You’ll notice the question “Still want to use DNA Circles?” just above the “Explore” button. DNA Circles is a previous tool that also showed you how many of your DNA Matches shared a common ancestor with you and offered an easy-to-read graphical representation of how you’re related. It’s not clear if ThruLines will replace Circles at this time, but we’ll keep you up-to-date as we learn more. Once you click on ThruLines, ancestors from your current tree are listed by generation: parents, grandparents, great-grandparents, etc.. Each one displays the feature image you’ve chosen as well as the person’s name, relationship (“i.e. paternal grandfather”), and birth-death years if available. Clicking on your ancestor’s profile opens a new window that displays which of your qualifying DNA Matches are potential cousins through this particular person. Because these ThruLines results are laid out like a family tree, it’s easy to see how these six individuals are potentially related to me, which I find helpful. In this case, I have already proven through traditional documentation that Maureen and Kathleen are indeed my second cousins, but I have not connected or even researched Joshua yet. 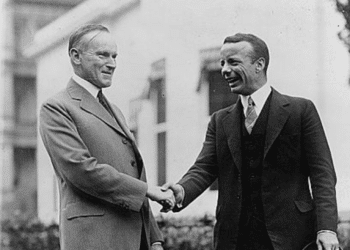 Now that I know that he may be the grandson of Robert Riley Simpson, I can go back to the tried-and-true methods to prove or disprove this fact. For those who enjoy and understand the science behind DNA, ThruLines (and the “new and improved DNA Matches listing,” as well) shows the number of centimorgans you share across a certain number of segments with your match. Back on your ThruLines home page, you’ll see that some profiles are outlined with a dotted line. 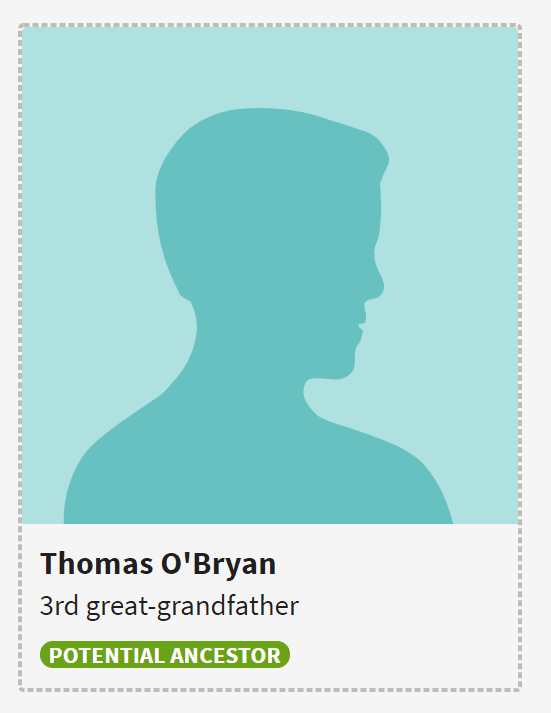 That’s the case for Thomas O’Bryan, an individual who might be my third great-grandfather. Clicking on Thomas’s name takes me to his profile in Tammy’s tree; unfortunately, there are no sources in Tammy’s profile for Thomas to support the theory that he is indeed our elusive ancestor. But it might be worth reaching out to Tammy to see where she came up with this name, and use that information for further research. It’s fascinating to see people I may descend from in this way – especially considering that Ancestry sometimes needs to patch together several trees to bring up this suggestion, and many of the trees’ creators are related to me genetically. Just remember though, potential ancestors are just suggestions from Ancestry and the information is only as accurate as the trees it is based on. Never add anything to your own tree unless you have verified the details. 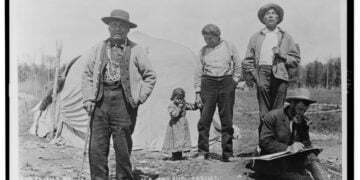 Around the same time Ancestry announced Thrulines, MyHeritage introduced the Theory of Family Relativity, which we also tested and reviewed here. 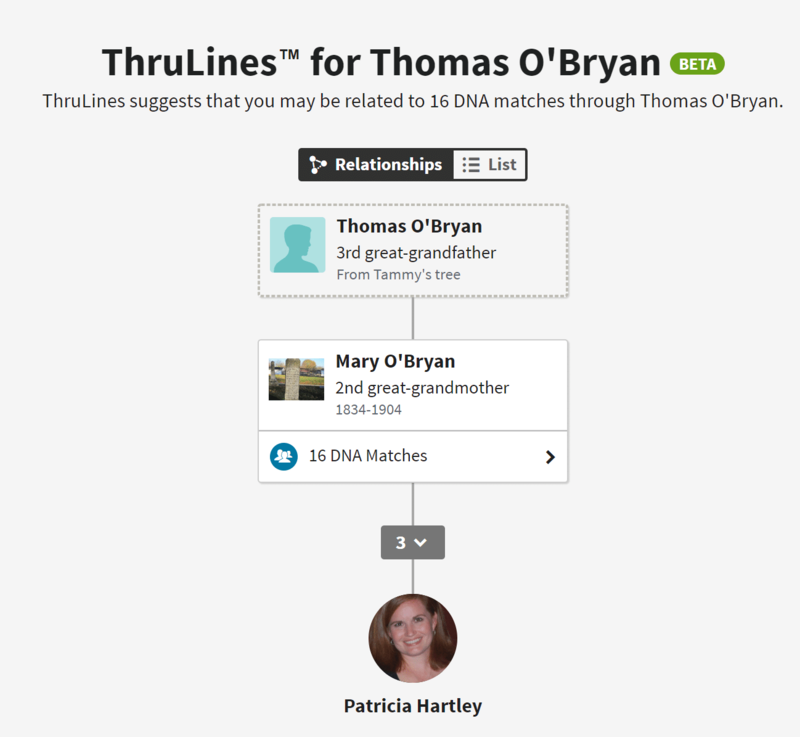 Like ThruLines, “Theory” uses information from the family trees built by MyHeritage users who have attached DNA results. 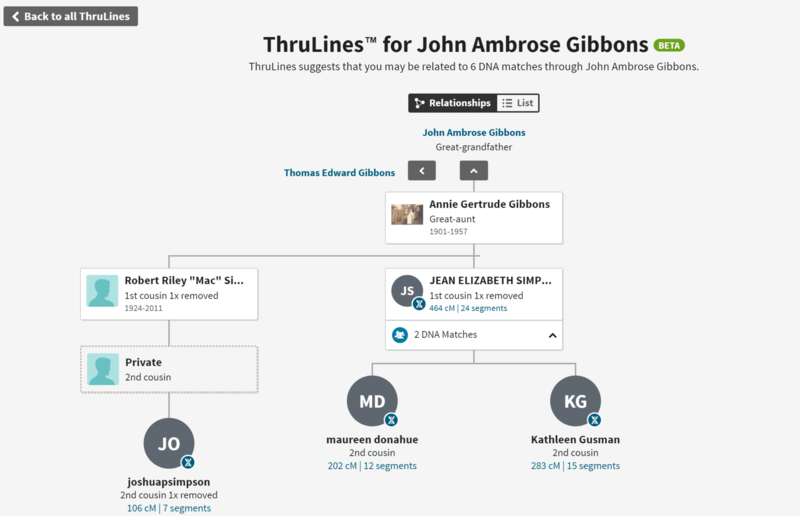 Unlike ThruLines, Theory also uses information gathered from historical records and other large family tree databases like Geni and FamilySearch. These additional resources make for a powerful DNA matching machine. Unfortunately, we were disappointed by the small number of matches that actually offered Theories. 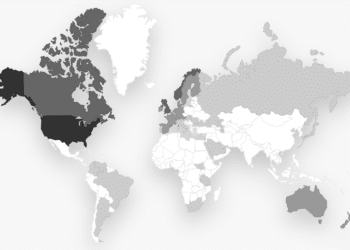 MyHeritage started the year with 2.4 million DNA participants, which is a fraction of the 10 million in Ancestry’s database. 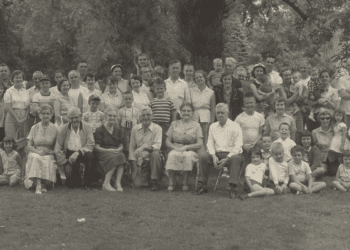 Of those 2.4 million, a surprising number have not attached their DNA results to a MyHeritage family tree, which results in a fairly small pool of tree-connected DNA from which Theories can be created. Theory does provide data on shared centimorgans and segments, and displays potential relationships in a tree-like format that’s easily navigated like ThruLines. In addition, Theory offers filtering tools to help you sift through your results, separating those matches that have Theories from those which don’t, for example. Lastly, if there could be multiple ways you could be related to a potential ancestor, Theory shows you each potential path in order of reliability, which gives you a good direction from which to begin your search for evidence. 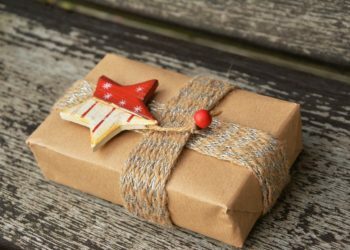 Overall, there is no doubt that MyHeritage offers more robust DNA tools than Ancestry, and a seemingly larger number of non U.S. testers, so you do not want to miss out on trying their tool as well even if you can expect less suggestions. Find out how to use their system here or jump in by uploading your DNA now. 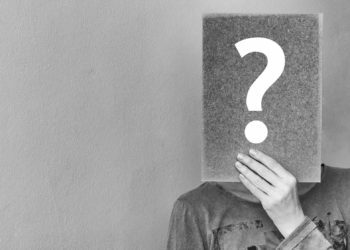 No matter which option you choose to assist in your search, proceed with caution, understanding that both MyHeritage’s Theory of Family Relativity and Ancestry’s ThruLines are just tools. 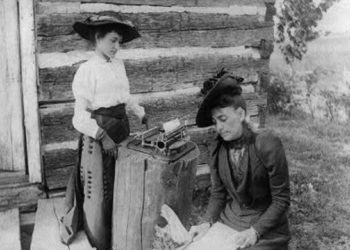 There’s just no substitute for good old-fashioned genealogy work! I the current state of ThruLine functionality, I am confident that Thrulines can help entire families believe that someone is who we thought they were even if they do not exist. I have a potential ancestor pointing to a man who my family thought existed because of naming conventions and when Census data for surrounding family was available, but it turns out the man never existed. The real man, father but not husband to the mother in question, is a man with a different last name. Thrulines is not making the connection to this real person but his descendants are my DNA match and I see this person listed in their trees and have properly listed him in mine. At this time, I cannot remove the incorrect potential ancestor so my ThruLines are stuck and I need to make the connections without it. Even more troubling, is that I cannot contact the tree owner, if the tree owner is not a DNA match with me, to send correct info and proper source documentation to prove the man doesn’t exist, and to ask them to fix their tree (yet, maybe ancestry will change this policy). I am having an issue with Thrulines perhaps someone can help. 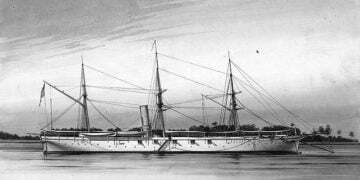 I started a family tree back in 2015 with information that I knew and waa supplied to me. I recenyky submitted my DNA and to my shock discovered my biological father was different from who I thought it was my whole life. How can I delete the incorrect information? Ancestry’s online tree does not allow you to delete an entire line (or export only portions of a tree to create a new one). You can, however, do this with many family tree programs such as RootsMagic or Family Tree Maker. RootsMagic explains the process here. RootsMagic also syncs with your Ancestry tree (as does FTM), so all records should be maintained as well. The other option would be to delete people manually, one by one. Good luck! Leave the line you knew all along, but change the relationship from Biological to adopted or some other supported relationship and add the Biological fathers information as you research. There is no reason to delete information that Is correct when instead you can correct information that is not. I use Family Tree Maker and sync my tree but I am certain there is a relationship editor on ancestry to allow this father relationship to be modified. I don’t claim to be a thorough researcher but Thru Lines has been very helpful to me, especially where I’ve had dead ends. 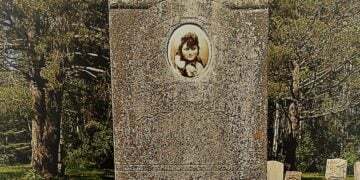 In one case I had a one generation blockage where my 2nd great grandfather did not seem to have an accurate birth date and I could not confirm that he was actually the correct person among his siblings. Thru Lines showed that almost all decendents of his siblings match a portion of my DNA. So now I think I can be fairly confident that the line I thought was correct is, most likely, correct. All along, all other information seemed to be correct but I couldn’t accept it without confirming that one linkage. Of course, it could be that everyone to whom I’m genetically related to in this line has made an error.